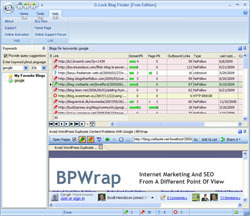 Fast Blog Finder is designed to search for blog posts that rank in Google for a particular phrase and makes it easy to comment on them. Fast Blog Finder searches for quality blogs that accept comments. It brings up blogs with both "dofollow" and "nofollow" tags. It also shows the Google PageRank for each domain and blog page post and has options that can be tweaked to filter by Domain PR, Page PR, link type, date and user note. You can export a report about your blog comments to a user definable format at any time. With a powerful Backup/Restore feature you will never lose your keywords and blog lists found for these keywords. You can save a full backup of your workplace and restore it whenever you need it.